After many days (and late nights) of planning, designing, coding, tweaking, and testing, the brand-new PodWorx.com website is LIVE and ONLINE! 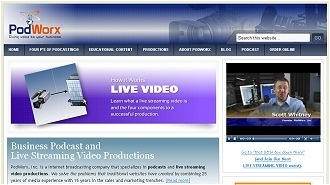 Given the growing interest in podcasting and live streaming video productions, we expect the new PodWorx.com will be a valuable asset to those tasked with learning about and implementing either (or both) of these online sales and marketing techniques. So, what do you think of the new website? We’re still tweaking here and there so I’d love to hear your feedback! Great new look for you guys Scott! I too have gone to a more user-friendly interface at http://www.acktivemedia.com. You’ll probably recognize the blogging/CMS. Yep, it’s WordPress. After dabbling with Drupal and thinking maybe Joomla, I was convinced WP was the way to go, especially with the themeing capabilities, ease of video/audio embedding, RSS functionality, huge community, and plugins beyond belief. I believe you make no bones about running WP as well. A suggestion about your RSS feed…have you thought about Feedburner? It prevents a situation like the one you just had. Plus stats, podcasting functions,badges galore, itunes, etc. And you can run multiple feeds through one account. Just a thought. Also, are you using Libsyn? What are your thoughts? Keep up the great content my friend. Thanks, Stefan. I appreciate the feedback. Feedburner: The multiple emails were not a function of the RSS feed, it was a function of me messing with the dates of the post on the new website. Had I left the dates alone, that wouldn’t have happened. I personally don’t use Feedburner because 1. Branding. I’m not a big fan of giving somebody else branding credit for my content/feed. 2. We have real-time stats for our blogs and podcasts because of the way we configure our servers. 3. We run multiple feeds all the time. For example, the podcast and blog feed are naturally coming from the same overall feed. 4. Stability. We’ve never experienced the occasional technical problems I’ve heard others complain about when using Feedburner. Lybsyn: We are hosting our content on our own servers. That allows us to track our podcast downloads in real time.